Into its third season now and a very entertaining show. 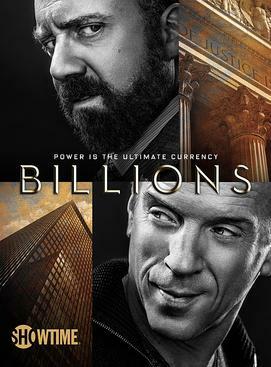 It's a Macaveilin story of power, revenge, a real cat and mouse battle between Charles "Chuck" Rhoades Jr. (Paul Giamatti) a U.S. Attorney for the Southern District of New York and his legal battles with hedge fund manager Robert "Bobby" Axelrod (Damian Lewis). It's a really well written show and you find yourself cheering on both characters as one tries to outwit the other were the role of 'cat & mouse' changes. One of the best shows right now if you like dialogue driven drama. Billions will be back this Sunday, woohoo!